At 6-3, 239, Mark Ledbetter was a rangy tweener from Washington State who saw playing time at a variety of positions along the line in college. A jarring hitter, he once broke an opponents jaw during a game. 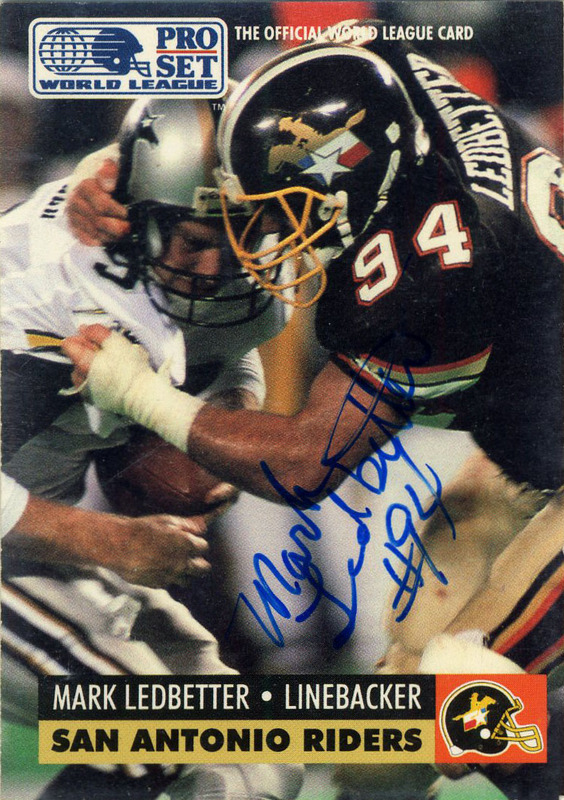 Signed by the New Orleans Saints in 1990, Mark was drafted by the Riders in 1991. Ledbetter would end up playing both outside linebacker and defensive end for San Antonio, where he’d finish third on the team on tackles with 35 solo stops and second on the team with 6 sacks. In 1992, Ledbetter would be named second team All World League as he made 5 sacks. Ledbetter would finish as the franchise’s all time leader in sacks with 11. After the WLAF reorganized in 1992, Ledbetter would join the Sacramento Goldminers during the CFL’s ill fated attempt to expand into the United States and then later the Birmingham Barracudas in 1995 playing on the defensive line. After football it appears that Mark has pursued football coaching and at last glance in 2008 he was coaching high school football on Vashon-Maury Island. Below are his San Antonio Riders statistics.